Yesterday, while I applying my RBL Dead Calm mani, I realized that I can't stand my index fingers. They bother me on both hands, but my left hand is especially annoying. The reason is that unlike the rest of my nails, these nails in particular, have a slope on the outside edge. See below. See... isn't that maddening. 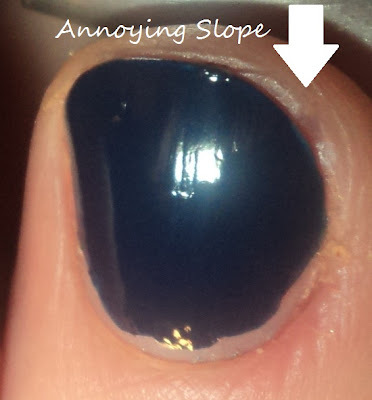 It just doesn't grow up like the rest of my nail. It's most evident when my nails are longer, too, so I either live with super shorties or sloping indexes. :P Plus, this finger is the one that gives me the most trouble in the cuticle area (as you all may be able to tell in my pictures). Grrrr. So do you girls have any problem nails?